I have never owned a pool before. Getting ready to have a 24' pool installed with a waterway 125 sq ft cartridge filter and hi flow variable speed pump. Is this a good system? Also, can it be hard plumbed? Any suggestions would be appreciated. Hi Melissa. The filter sounds like it would be a good system. I'm a big fan of two speed pumps and cartridge filters to a fine job. I have not seen a system yet that could not be hard plumbed, but what I like even better than that is flexible PVC. Flexible PVC pipe is very easy to work with, uses less fittings, and will last nearly as long as solid PVC. It also has the advantage of having some give to it. Solid pipe is just that, solid. But your pool walls are not, they have some give and some movement. Using a pipe that has some flex will allow the wall to flex the way it normally does. Hi That is so true about pool hoses. It is even worse when they break in the middle of the night, or when you are on vacation. The photo above should show you everything you need to know. Use male adapters, flex PVC and maybe an elbow or two. You will be glad you did. When placing an above ground pool into the ground, where and how is the place to put the sand filter, salt water system, etc? I am putting a 24-ft, 54 in deep pool 36-42 inches (not sure yet on depth) into the ground. I have only 5-6 inches of fall from one end to the other. Where do you suggest putting the equipment mentioned above? Hi Jim. 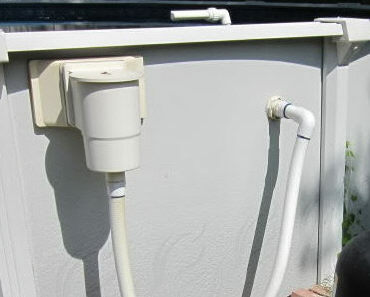 Above ground pool pumps are designed to be gravity fed, so the hair and lint pot on the pump just needs to be below water level. I would set the pool up so that the filter system could sit at ground level and still be gravity fed. Your other options are to sink the filter system. The problem with this is rain water. You do not want the filter system sitting in water. If you can solve that problem this is a good solution, one I have seen done many times. Setting the system up on ground level, above the water level, will mean having to prime the system on a regular basis. It could also mean not being able to use a timer because you don't know if the pump will start each time. In ground pool pumps have a different impeller setup and are meant to draw water uphill and from a farther distance. One way to set up the system is with an in ground pump set back away from the pool, in a convenient location, at ground level, and not have to worry about whether the pump will stay primed. Does our pump have to be below our above ground pool or can we trench the pipe to the garage and have it in there? Can the pump be higher then the skimmer? Hi Brenda. You have just mentioned two of the biggest differences between pumps designed for above ground pools and those designed for in ground pools. In ground pool pumps have larger impellers are designed to draw water up hill and from farther distances. If it were me, I would continue as planned. Setting the filter system up in a designated area, one of your choosing, can be very important. There are many reasons for doing this, and most of them are valid. One of the first pools I ever set up for myself was all the way in the ground. I installed an old Muskin 3/4 HP pump and filter on top of the ground about ten foot away from the pool. I never really had any problems with it. It would draw a sufficient amount of water and did a good job of keeping the filter clean. Above ground pool pumps are gravity fed, by design, so I did have issues with keeping the prime. I would not have been able to set the system up on a timer because I would never know if the pump needed re-primed. Had the filter turned on, with the pump out of water, it would have burned out. This would usually only happened during filter cleaning, when I would have to re-prime. But it did happen enough other times, for no reason, that I never hooked it up to a timer. My suggestion would be to set the system up the way you want. You can then give it a try. If it really won't work you have two choices. You could move the entire system back near the pool or you could replace the pump with an in ground model. Good used pumps are not that expensive and once you have used an in ground pool pump on an above ground pool, you will never go back to the above ground version. If you do end up replacing the pump, go with a 2 speed model. There again, once you try it you will never go back to one speed. What do I need to hard pipe a Doughboy filter? Hi Scott. Doughboy sells a hard plumb adapter kit. It is basically six rubber couplers and twelve hose clamps. The rubber couplers have different sized ends, one end fit's the fittings on the filter, skimmer and return while the other end accepts 1 1/2" PVC pipe. You simply attach the adapter to the Doughboy fitting and tighten the hose clamp, you then insert the PVC pipe and tighten another clamp. The adapters fit the skimmer, return and all four filter system locations. This allows the entire system to hard plumbed with 1 1/2" PVC pipe. 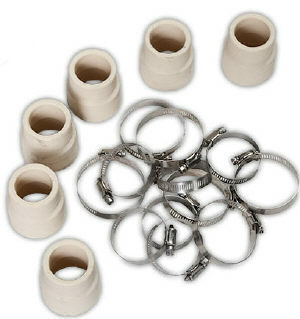 Doughboy hard plumb adapters can be purchased anywhere Doughboy pools and parts are sold.